Image: Matthew Henry via Unsplash. Today is Data Privacy Day, and to mark the occasion Facebook has launched Privacy Basics, a new guide to understanding and controlling who sees your activity, from liking posts and using apps to sharing links and photos. The guide aims simplify the platform’s sometimes confusing labyrinth of privacy settings, and help users to make use of these setting by providing them in one place. Facebook has grown over the years to fulfill multiple roles in users’ lives, making it unique among social networks. Most users want to keep in touch with family and friends, and use it to share everything from pictures of their daily lives to milestones such as an engagement or the birth of a child. However these same people also use Facebook to follow the news, engage with businesses and brands, and share links and stories that reflect their values and world view. They will also participate in group discussions, chat privately with friends, and comment on and react to a variety of posts across the network. Many will also use their Facebook accounts to log in to third party apps and sites, and comment on blogs that use a Facebook comments plugin. This adds up to a lot of data tied to your profile. Your Facebook friends include your actual friends and family members. However you are also friends with friends of friends, people you knew in school or college, and people you know because you work in the same company, or in the same field. And whether by accident or design, a lot of your activity on Facebook can be seen by everyone. If you’re using Facebook to promote your work, you probably want everyone to see these updates. However you may also want to share family photos without publishing them to the whole world. And you may want to play Candy Crush Saga at work without advertising your progress to your colleagues, or boss. And it’s not just other users who can see your personal data – Facebook’s massive value lies in the wealth of information it collects on its users, which it can then use to sell targeted advertising space to other companies. So information on every website you visit, and every ad you click on, is logged for future reference along with everything you ‘like’ within Facebook itself. Privacy Basics is Facebook’s most comprehensive guide to privacy to date, with a total of 32 guides to settings, available in 44 different languages. 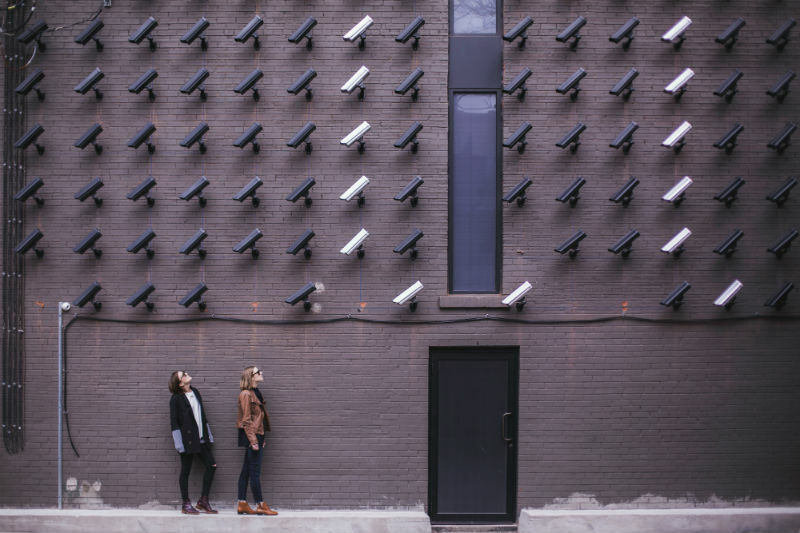 The guide includes information on several aspects of privacy and security, including the privacy checkup and information on how to control the Facebook ads you see both on and off the platform. The guide is worth looking through to get a better understanding of how you can take control of how you appear to different users, from friends to strangers to advertisers, and the Privacy Checkup is a great way to adjust your posting and app settings without having to navigate through a plethora of menus. Speaking of the plethora of menus, there are still a lot of different settings to find and change if you want to start adjusting your settings. To make this process even simpler, I’ve listed just a few of the ways you can control your privacy below. You can specify who can see your updates by default in the security menu – just click on the little padlock icon in the top right of your news feed. My updates are set to public by default, but you can also opt to be visible only to friends, or even to a specific group of friends (click ‘more options’ below friends in the drop down menu). Whatev er default setting you choose, there will be times when you want to change that setting for specific updates. While most of my posts are public, I don’t necessarily want every single post to be visible by everybody. On those occasions when I want to post something that only my friends can see, I change the settings in the drop down menu under the post window. 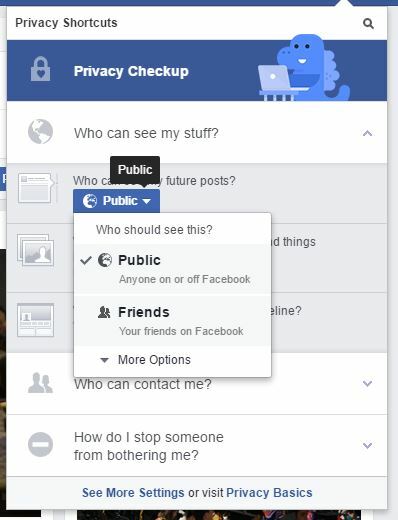 This is an easy way to check which of your updates are public or private. Go to your profile, and click on the ellipsis icon (…) beside ‘View Activity Log’. You’ll find this to the bottom right of your cover photo. Then click on ‘View As…’. This setting will bring you to a view of your Timeline as it appears to the public – basically everyone. If for any reason you want to see what your Timeline looks like to a specific friend, you can type their name in the box provided. 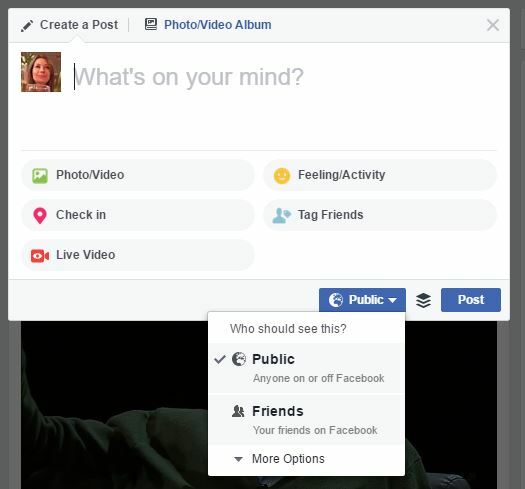 If you find you’ve been oversharing and a lot of your old posts are public, you can very easily change this so that all of your past posts can only be seen by your friends. Simply go to your Privacy Settings, and under ‘Who can see my stuff’, click on ‘Limit Past Posts’ and follow the instructions. This will limit everything you have ever posted to friends only, but it’s useful if you find there are a huge number of posts you want to change. This is available under Timeline and Tagging Settings and is useful if you want to control who can tag you in posts and photos. From here you can decide who can post to your Timeline, as well as who can see these posts. 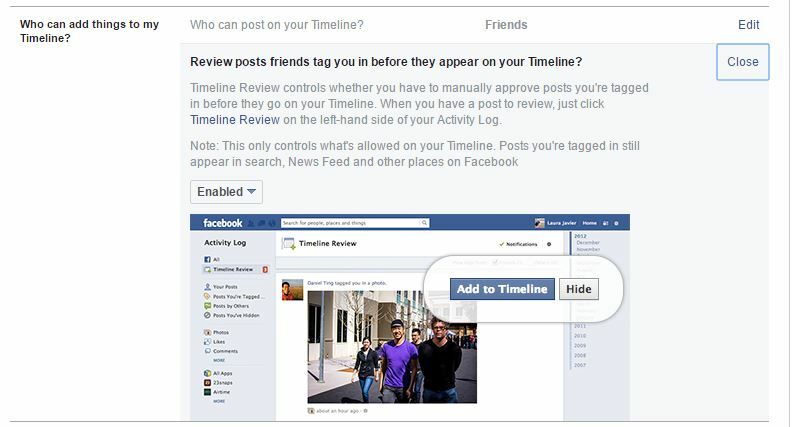 You can also choose to review any posts you are tagged in before they appear on your Timeline; this allows you to decide who can see photos and other posts before they are visible to anyone. Facebook uses all the information you provide through your actions to serve you ads that it believes will be most relevant to you. You can change some of this information in Ad Preferences. Much of these settings control what ads you see both on Facebook and on third party sites which show Facebook ads. One setting you may want to change is ‘Ads with your social actions’. When showing an ad to someone in your network, Facebook will include the fact that you like the page serving the ad. This can be set to ‘Only my friends’ or ‘No one’, based on how comfortable you are endorsing brands without knowing about it. You can also review your interests here, which will give you a list of what Facebook thinks you are interested in. This can be a revelation – Facebook thinks I care about scrapbooking, for some reason – but it does give you some control over the ads you see. If you follow the privacy checkup and the steps I’ve outlined above, you will have much greater control of your data. Try to make a habit of checking your privacy settings periodically, and changing your password regularly, so you can enjoy the benefits of the world’s biggest social network and the peace of mind of knowing you control how others can access your information. Facebook is a wonderful tool, but like any complex tool it needs to be calibrated regularly.